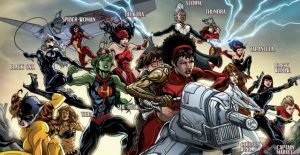 On the subject of making pseudo-controversial changes to classic Marvel characters, [Marvel’s Senior Vice President David] Gabriel added that internet outrage is never a good indicator of what actual comic book readers and fans want. “The first thing we do is watch the sales. If you watch the Internet and the message boards, you would do the wrong thing. How Marvel Comics Alienated Their Core Readership for Profit, Emily Gaudette, inverse.com, August 17, 2016. Getting the raw data from the project and the organization was always the best way to balance the energetic opinions of the various experts and managers. For example, I recall hearing, week after week, that we would be ready to ship the product by the end of the week. However, it never seemed to happen. Well, we shipped about nine months late. It took us several more years before we were split up and sold off as a business. The emotions of the moment, even as the data was clearly showing us where we really were, kept us from dealing with reality. The reason we were sold off at a high discount was in large part because we consistently over promised and under delivered. So the VP was right, but for the wrong reasons. The customer wanted an on time product with good quality, not a promise to deliver faster than we could. Using real data from good sources helps to anchor our decision making and often, but not always, helps to settle down those emotionally driven opinions. The trick is to dig in and then find and understand the data and what it is telling us. This helps those pseudo-controversial decisions to become objectively driven, profitable, decisions. What data are you using to anchor your confidence in how your project team is performing?